Parmesan cheese is an extra-hard dairy product made from cow's milk. Its sharp, nutty, slightly salty flavor is a natural accompaniment to Italian cuisine. To qualify as authentic Parmigiano Reggiano, it must come from specific regions in northern Italy, contain no holes and ripen for at least one year. Adding Parmesan cheese to your meal plan can enhance the flavor of foods and provide your body with a nutrient boost. Your body uses protein to repair and maintain itself. A major part of your skin, muscles, organs and glands, protein exists in every cell in your body. 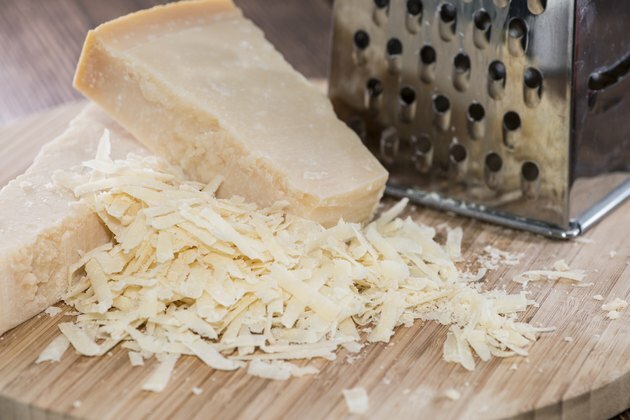 A 2-ounce serving of Parmesan cheese contains about 20.3 grams of protein, which is 41 percent of the daily value, set by the U.S. Food and Drug Administration and based on a 2,000-calorie diet. Calcium is essential to your body's proper growth and development. An article published in the journal, "Clinical Cases in Mineral and Bone Metabolism" in September 2011 notes that numerous studies have established that dietary calcium, along with protein and vitamin D, are essential for achieving peak bone mass and maintaining bone health. Parmesan cheese is easily digested and an excellent source of calcium with a 2-ounce portion containing 671 milligrams, which is more than 67 percent of the DV for this mineral. This cheese also contains small amounts of vitamin D.
Vitamin A aids in good vision, particularly in low light. Sufficient vitamin A is also needed for healthy skin, teeth and body tissue. A 2-ounce serving of Parmesan cheese provides 443 international units of vitamin A, which is about 9 percent of the DV. Although Parmesan cheese provides valuable benefits, it's wise to also consider its sodium content. Consuming too much sodium can increase the risk for high blood pressure, heart disease and stroke. A 2-ounce serving of Parmesan cheese contains 780 milligrams of sodium, which is 32.5 percent of the DV. The Dietary Guidelines for Americans, 2010 recommends that adults in general should consume no more than 2,300 milligrams of sodium per day. If you are age 51 or older, African-American, or have high blood pressure, diabetes or chronic kidney disease, you should limit your sodium intake to 1,500 milligrams per day.